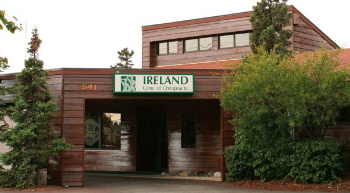 Dr. Trevor Ireland founded Ireland Clinic of Chiropractic, LLC in 1971, and relocated the practice to its current midtown location in 1980. For over 40 years, he and his colleagues have been helping the people of Anchorage find the relief they need to stay involved in their active lives. We have built long-term professional relationships with our patients, and are proud to serve the community that has long been our home. As a local healthcare clinic with a long history of service in Anchorage, we are proud that the 2014 Kelly Cup Champion Alaska Aces hockey team and the Anchorage Bucs baseball team have both chosen Ireland Clinic of Chiropractic, LLC as their official team chiropractors. Our four skilled chiropractors and collective years of experience allow us to care for a diverse group of patients, each with unique health concerns. We help you get back to working hard, playing hard, and living the Alaskan lifestyle. Whether you are seeking relief from pain, correction of a health condition, or the restorative effects of ongoing wellness care, we want to help you reach your individual health care goals and potential. Dr. Trevor Ireland helped build our current location in 1980 with a natural design and landscape that reflects the beauty of our location here in Anchorage. A covered drop off allows patients to enter the building without having to battle the elements. We want you to be comfortable during your visit. Inside, our practice is inviting, warm and homey. You’ll find it easy to relax and enjoy your care. Learn more about our chiropractic practice by browsing through our site. We’re happy to answer any questions you might have. Please call us with questions or to schedule your first appointment.